The Roman Chair/ Captain's Chair is a very popular piece of ab equipment, and most gyms have some form of this ab machine. Hanging leg raises are a challenging ab exercise, but many people have a hard time holding themselves up from a bar. It's much easier to hold yourself up on a Captain's Chair/ Roman Chair, so you can focus on your abdominals. 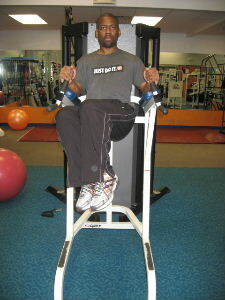 Below are pictures for oblique knee raises on a Roman Chair. Starting Position: Begin by propping yourself up on a Roman Chair, and let your legs stay straight. Form: Exhale and bring your knees towards your chest. As you get halfway to your chest, bring your knees over to one elbow. Hold for a brief second and then return to the starting position. Personal Trainer Tips: You must have decent upper body strength to hold yourself up, so if you are a beginner try different ab exercises at first. Make sure that you don't slouch. If you feel yourself sinking and your shoulders rising closer to your ears, take a break and readjust your position. You can do this ab exercise 2 ways. You can perform all the reps on one side and then switch to the other side, or you can do this exercise in an alternating fashion. Perform 5-15 repetitions on each side. By bringing the knees to one side, you add more emphasis on the oblique muscles, but you can also do this exercise bringing the knees straight to the front. 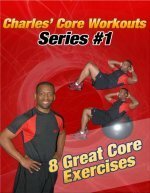 If you don't have access to a Roman Chair, try another exercise from the Picture Directory of the Best Ab Exercises. 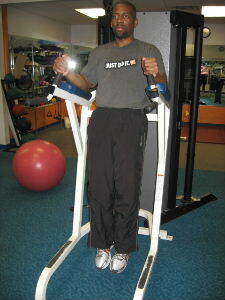 Or read about various types of ab equipment.